BOSTON — As residents here continue to recover from the tragedy that occurred during the Boston Marathon, fundraising efforts by community members to help those affected are still in full swing. Roger Mirchandani, owner of Signature Cleaners in the greater Boston area, is among those who have donated money to One Fund Boston, the charity established by Massachusetts Gov. Deval Patrick and Boston Mayor Thomas Menino to assist victims and families affected by the bombing. 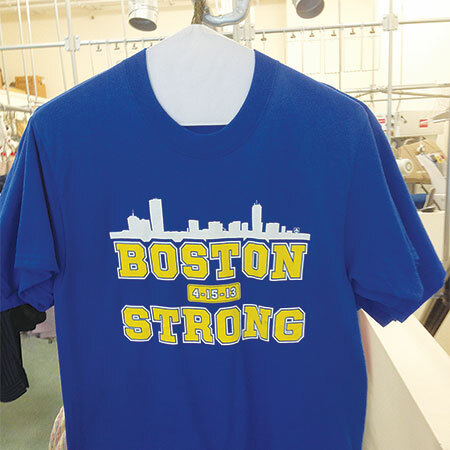 Because he also has experience in embroidery and screen printing, Mirchandani decided to design and sell T-shirts imprinted with “Boston Strong” as a way to raise funds. “The first time, we ordered 200 [shirts and] within a week, we sold out. I ordered 300 more [and] within the next two weeks, we sold out,” he says. Mirchandani began selling the T-shirts in the beginning of May at his store’s four locations for $10 each, with all proceeds from T-shirt sales going to One Fund Boston. Overall, Mirchandani was able to raise $3,000, which he donated last week to the campaign. “The response was unbelievable, just for the fact that the first batch of 200 we got within a week were gone,” he says. Though he recently made the donation, interest in the T-shirts remains high. Mirchandani expects to get the shipment of new T-shirts soon, and will continue to donate proceeds from their sale to One Fund Boston. Carlo Calma is a freelance writer and former editor of American Coin-Op.